The Trading Cube Scanner is another tool for the trader/investor's tool box. All markets, sectors and stocks have qualified trends of varying strength characteristics. Neo TA maintains a database of these qualified trends for most trading instruments which is updated nightly after trading for the day has completed. 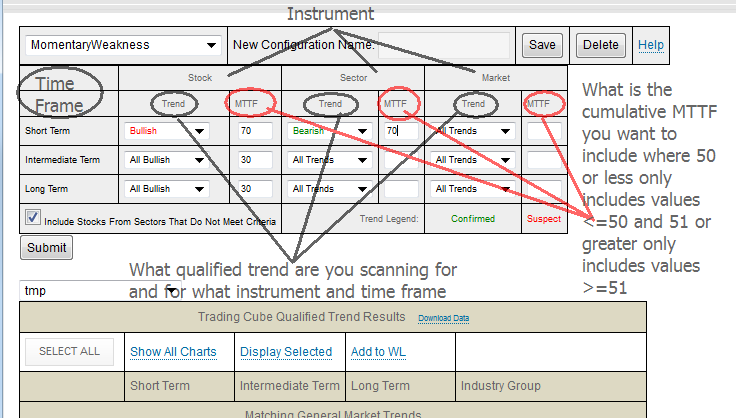 Qualified trends are computed on three time frames - short, intermediate and long term. More information regarding the basic concept of The Trading Cube can be found here. The Trading Cube Scanner gives you the ability to specify criterion that you can use to narrow the list of stocks down to a manageable size that is solely dependent on the qualified trend and the cumulative MTTF characteristics that you specify. Here's a short video introduction follow by more textual help. Here is a picture of the Trading Cube Scanner's when you first access the screen. Note that you have the ability to specify and save configurations that you care about for later use. Essentially, you choose values for the trend type (All Bullish|Bearish|Sideways or Confirmed Bullish|Bearish|Sideways or Suspect Bullish|Bearish|Sideways) for each of the time frames (short, intermediate, long) for each of the instruments (stock, sector, market). You also are able to specify the MTTF (mean-time-to-failure) as being small or large / young or old by placing a value in the box associated with the instrument on the time frame you care to filter on. Leaving it blank will match all MTTFs. Options traders find this Trading Cube Scanner as an invaluable tool for find actionable options trades. Like for all the other tools on the Neo TA tool set you can easily view a single chart/time frame or all time frames as well as easily save the symbol(s) to a watch list.